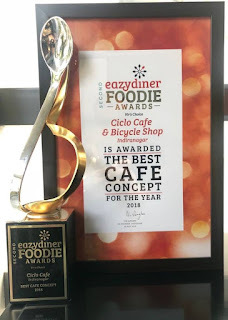 Bangalore, 24 July 2018: Ciclo Café, India’s first cycling-themed, lifestyle café was awarded the Best Café Concept award at Eazydiner’s recently concluded Foodie Awards for Bangalore - 2018. Renowned food connoisseur Vir Sanghvi, India's best-known food writer and TV host, turned the spotlight on his picks for the best restaurants via his signatory ‘Vir's Choice Awards’ for the hospitality sector. Ciclo Cafe (pronounced as Chee-klo) is operational in the F&B hub of Bengaluru at Indiranagar and offers well-lit spaces with comfortable long-table settings for families and larger groups alongside a relaxed seating area for more intimate gatherings. Its interior design integrates delightful use of bicycle components built into the décor, which is a visual treat for guests. The carefully curated menu is designed to cater to the metropolitan crowd of Bengaluru with interesting twists of flavors from across the globe and includes tantalizing dishes like Telangana Mutton, Grilled Kasundi Black Pomfret, Pork Belly Taquitos, Roast Chicken with Spirulina and Jalapeno Rissoto to name a few. The cocktails and mocktails showcase a range of specially crafted flavors that has something for everyone. “We started Ciclo Café with a view to provide a great dining experience to food enthusiasts and create an inviting space where people can meet up over a coffee or a meal. Ciclo also provides a space for cyclists to discuss their passion while getting their bikes serviced or while sampling flavors from around the world. For Team Ciclo this reputed award is a recognition of the concept of a cycling café - combining great food alongside a healthy lifestyle. ” said Mr. Ashish Thadani, CEO Ciclo Café. 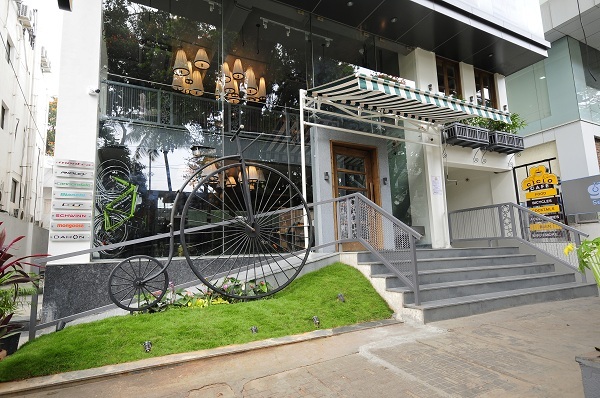 Ciclo Cafés are currently situated at Chennai, Bangalore and Hyderabad. With a vision to bring together members of the cycling community, Ciclo Cafe, India's first cycling cafe chain gives you access to premium dining as well as top cycling brands. Ciclo Cafe provides sales and service of premium bicycles, merchandise and accessories, expert advice on cycling, special activities and customised cycle rides – all accompanied with world-class hospitality in the form of premium F&B services with international cuisines.